As always Latitude 38 never disappoints. We had a delightful getaway! We loved our stay. The property was a great size for a two bedroom place. It was nice to have a fully stocked kitchen and a washer and dryer. We loved the location, it was the first time staying in Mountain Village. Everyone I talked to at Latitude 38 was very friendly and helpful. I also appreciated the welcome basket with all the fun stuff inside. Our stay was excellent and the staff was wonderful! 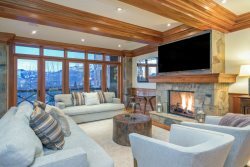 A lovely condo, and something we will definitely consider during ski season as well! Latitude 38 is an excellent company. This is our second time to go through Lat 38 and they are always available, prompt, and make our stay seamless and very easy. It is actually amazing how easy they make it. Everytime I look to stay in Telluride, or if I talk with my friends, I go to Latitude 38 first. Allison and her team once again did a 1st class job in making our family getaway go perfect. The Munite we arrived to the property there was a member of her team to help us into our property. He explained all functions of the property. What another great experience with Allison and her team. We will be doing business with her and Latitude 38 many more times. They have earned my business. See you again. We had a great time and like the property alot. It was little far off the beaten path and the dial-a-ride wasn't readily available on one the days, so we drove our car to the parking lot most days. It wasn't a big deal though. I think we'd prefer to be a little closer to the gondala in the future. this property was perfect for our week long stay . Great location with a great view and true ski in ski out property. The chondola and gondola made getting around with out a car very easy and convenient. Mountain Village and Telluride are truly a place to spend vacation and the staff at Latitude 38 is First Class!! - Activities - 4X4 Tours, Food Tours, Photography Tours, Fly Fishing Tours, White Water Rafting Tours, Spa Services, Yoga & Spinning Classes and more. SAVE TIME! Let us stock your vacation home with groceries/liquor or fresh flowers? $35/hourly for shopping and delivery plus the receipt cost.